What’s good? I’ve taken to using this bag when I go camping. Its 40-litre capacity is perfect to keep all the gear I need for a weekend away and because of this I always keep it ready to go, saving me having to pack and unpack all my stuff and it also means that I’m always equipped with everything I need. The roll-top means that all my gear stays dry, something I’ve tested in some pretty horrendous weather and it houses my tent, roll-up sleeping matt, sleeping bag, lights and tool roll. There’s a valve that allows excess air to be released making the size of the bag lesser if it isn’t fully packed. The GRT703 is held on with bungee straps that attach to the bike and there is a padded shoulder strap for when off the bike. 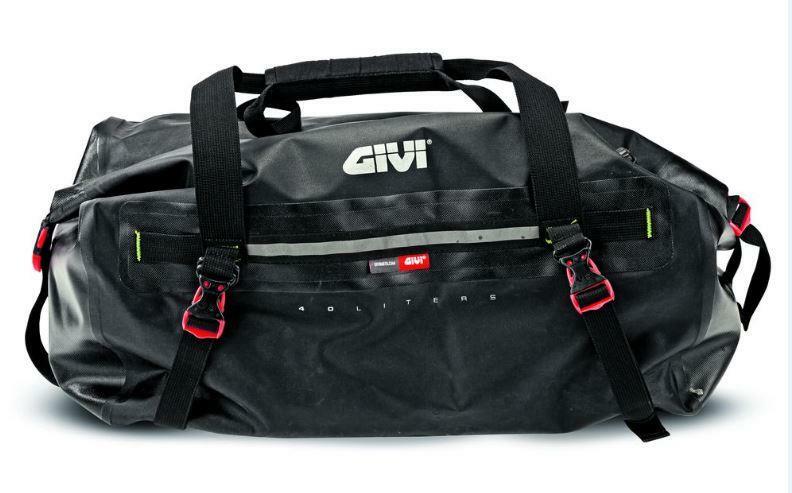 The pack also features a pair of straps that can be used with an additional 20-litre Givi GRT702 bag to expand capacity should it be needed. What’s not? I can’t ignore the fact that it costs a lot for what it is, there are other alternatives available that do a similar job for significantly less. Also, the bag works well for me because I use it across a set of panniers, but it doesn’t have a flat bottom so using it across a narrow bike may be a little awkward.